United Nations Education, Scientific and Cultural Organization (UNESCO) has declared 2011 as the International Year of Chemistry. Partnering with the International Union on Pure and Applied Chemistry (IUPAC), it intends to promote chemical education, recognize the achievements of chemistry and its contributions to the well-being of humankind, and celebrate the role of women in chemistry. The latter objective coincides with the 100th anniversary of the awarding of the Nobel Prize to Madame Marie Curie (she was awarded 2 Nobel Prizes – one for Physics in 1903, and the other for Chemistry in 1911). The theme of IYC 2011 is “Chemistry – our life, our future”. The year 2011 is the International Year of Forests, of Youth, of African descendants, and the expected time to redefine the ‘kilogram’, in addition to being the International Year of Chemistry. IYC 2011 was officially launched on 27-28 January in Paris, the headquarters of the UNESCO. In February, a postage stamp with a picture of a model of the Vitamin C molecule was issued by Swiss Post. The vitamin was first synthesized by Swiss chemist Tadeus Reichstein in 1933. Jersey Post, the international postal company, has issued a series of stamps on Women Achievement including that on Curie as a part of the 100th anniversary celebrations mentioned above. A postage stamp was issued in Spain bearing a rare photograph of Curie taken when she stayed at the student’s residence of the Spanish National Research Council. The American Chemical Society (ACS) celebrates IYC with “365: Chemistry for Life” at http://iyc2011.acs.org where discoveries and inventions that help humankind lead a better life are listed date-wise, categorized into energy, environment, health and materials. Its monthly journal IYC Virtual Journal throughout 2011 is also available at http://iyc2011.acs.org/virtual-journal/. The ACS celebrations include a chemistry rap and dance session as well! 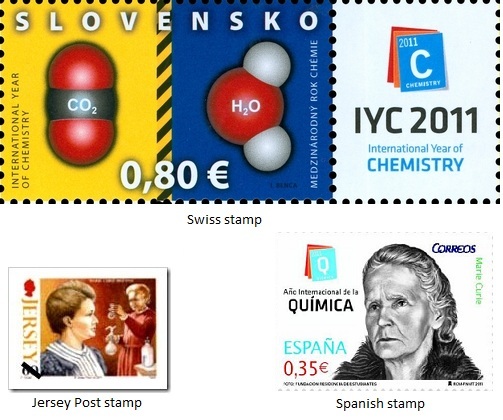 Stamps of Switzerland, Spain, and the Jersey Post celebrating the IYC and the 100th anniversary of Madame Curie’s Nobel Prize. Last in our list but not the least, the blog https://ondrugdesign.wordpress.com has been started to account the contributions of chemistry to the improvement of health and well-being of mankind… Welcome, and hope you enjoy your session!